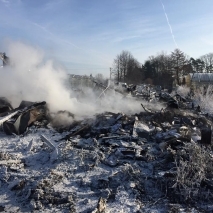 1/16/2017 - A massive fire destroyed the main office building at Spring Meadow Nursery early in the morning on Sunday, January 15, 2017. Six fire departments responded to the blaze and were successful in keeping the fire from spreading to any greenhouses or other structures. Nursery offices are being relocated on the property and will be fully operational with phone and email service by mid-week. No plants or growing space were lost in the fire. Customer orders are unaffected and completely secure for the coming season. Spring Meadow Nursery will continue to provide the same level of high-quality customer service and plant product as we work to replace our infrastructure. Nursery staff will continue to attend trade shows without interruption, including MGIX, CAST, Farwest, Cultivate, The Western, and several others throughout the year. Plans are already in process for a new and larger office to accommodate the continuously growing staff necessary to serve a growing customer base.